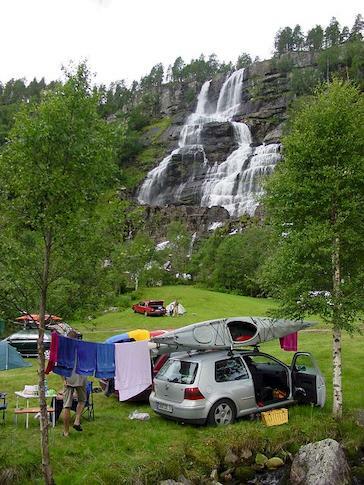 3 stars camping pleasantly located by the tourist attraction Tvindefossen waterfall (150 m. drop). It's a very good point of departure for various activities. Cosy cabins and apartments of different standards and sizes, capacity for entire coach parties. Tents, trailers, and area for residence camping with possibility of power attachment. First class sanitary facilities with large capacity , separate handicap room. Washing machine, tumble dryer. Kiosk with groceries and souvenirs for sale. Free WLAN.